Most things can be explained. Logic, reasoning, science, theories, tests…provide explanations. Sure. Some things are hard to explain…but most everything is explainable. But there are a few things that are simply…unexplainable. Carrie gave us the news yesterday. The good news. The phenomenal news. The unexplainable news. Travis’ cancer markers are down…again. Last time it dropped by 78,000. Obviously, it could not do that again since he only has 56,ooo+ left to go. But, because of the drastic decrease last time, you may not realize the HUGENESS of this result. You may not realize that this is actually a better result than last time…as if that was possible. Last time we saw a 58% decrease. This time? A 66%. Down 66% from two weeks ago. Explain, how after only 3 doses of chemotherapy, Travis’ cancer marker has dropped 88% overall. You can’t explain the unexplainable. But that isn’t all. Miraculously, the rest of his blood work came out perfect as well. His liver function test actually IMPROVED. Keep in mind…people getting chemotherapy for other cancers…breast, lung, colon, whatever, sometimes have to stop chemotherapy for a short period because their liver, which filters everything, needs a break. It just can’t handle all the toxins. Furthermore, keep in mind that Travis is working with a compromised liver. A liver eaten up with tumors. Tumors that inhibit liver function. So explain how a liver function test, on a liver with eight tumors that has to filter and process chemotherapy, actually improves? What about God’s love? Why is it you can turn away from Him over, and over, and over and yet He will always take you back? How come we can spit in His face…but He will still take us back? Explain how Travis can grow up in a Christian home, know the truth his entire life, push it away over and over and, instead of giving up on him, He waited. Arms open. For Travis to turn to Him. You simply can’t explain the unexplainable. In segment four of this six part series Travis discusses unexplainable love. We encourage you to watch the first three clips if you have not already – Not Your Typical Cancer Patient , The Discovery and A Death Sentence. We have more great news!!!! In three chemo treatments the tumor marker has gone from 161,000 to 19,500!!! The CT scan is scheduled for July 16th. Please pray that those lymph nodes are clean and clear. That would be an amazing miracle, and that is what we are praying for. We are going to travel to MD Anderson for an appointment in early August. We absolutely love our doctors here in Atlanta, but we want the doctors at the number one cancer hospital in the US to remember Trav. Just in case anything new comes along:). Thank you so much for all of the prayers and praises as we celebrate the good test results. Travis makes you laugh. He’s a clown. From what I hear, he always has been. I have yet to meet a friend of Travis who did not share some kind of funny story about him. And not just from childhood, college, or his roaring twenties. Stories from last week. He’s just that kind of guy. A jokester. Always has been and still is…despite being given a death sentence. A few weeks ago Travis’ good friend, Jason Mashburn, came to see him from Washington DC where he now lives. Mashburn was nervous. Nervous to see his good friend of twenty plus years. They had grown up together. Shared laughs together. Experienced a jeep catching on fire together. They had been in each other’s weddings. They know each other inside and out. But Mashburn was…nervous. What would he say to Travis? Would it be awkward? Could they talk about it? What if he said the wrong thing? Laughter erupted, hugs were given and Mashburn was completely at ease. That’s Trav. That’s just the kind of guy he is. But. Within a matter of minutes. Laughter erupted. Not giggles. Not snickers. Loud make-people-turn-and-look laughter. Why? Because it doesn’t take long to realize Travis is still Travis. The fun guy . The jokester. The prankster. The clown. As they strolled down memory lane laughter continued and, by the time it was time to say goodbye, there was peace. Comfort. Ease. Because that’s what Travis does. He puts you at ease. He makes you laugh. Despite being given a “death sentence”. In segment 3 of this six part series Travis discusses being given “A Death Sentence”. We encourage you to watch the first two clips if you have not already – Not Your Typical Cancer Patient and The Discovery. As previously mentioned, being interviewed on the spot can be nerve racking and mistakes can easily be made. In this clip, Travis states that an Adenocarcinoma is a cancer of the upper GI tract which isn’t quite accurate. Adenocarcinoma is simply a cancer that begins in glandular (secretory) cells. It often occurs in the breast, pancreas, lung, prostate, colon, and, of course, bile ducts. Additionally, to be clear, Cholangiocarcinoma does not “equal” pancreatic cancer but, rather, it is referred to as the cousin to pancreatic cancer. At least…not like you and I feel pain. He can’t relate to people who stay home sick. Sickness has never slowed him down. If he breaks his arm…he simply uses his other arm to wakeboard. If he is passing a kidney stone…he shows up for the tennis match anyway. When he had foot surgery on both feet he played golf two days later…bleeding through his shoes. Most things that would bring others to their knees…Travis tends to walk right through. It’s almost as if…he’s not human. So imagine my surprise. My shock. My fear. When I get the text last night that Travis is having unimaginable pain. Unmanageable pain. Unbearable pain. Travis’ scalp has been…”sensitive” since this past chemo session. My hunch is that Trav’s “sensitive” would equate to a trip to the ER if it were me but that is how he described it…”sensitive”. But last night there was something different. Something worse. It wasn’t his scalp. It was his brain. Three times. Three separate times. Pain. Sharp pain. Sudden, sharp, radiating pain sheering through his brain in jolts as if he is being struck with a cattle prod. Three times…evenly spaced throughout the evening…they hit. Pain that made him scream out. Pain that took his breath away. Pain that literally took him to his knees and showed that he is human after all. Can you imagine what it is like, when you have cancer, and face a new pain? Can you imagine what your mind does to you? It’s simply my friend who has cancer and, yet, any time I feel something weird inside or my kids complain of something weird…suddenly…I give pause. A second thought. A “what if” flashes through my mind. If I am like that…what is the person who has cancer cells inside his body like when there is a new pain? Can you imagine what his mind does to him? Especially a person who does not usually experience pain and suddenly has insurmountable pain. What goes through his head? What goes through his wife’s head? Is it in the brain now? If it’s in the brain…there are only weeks left. Today was better. It was back to being…”sensitive”. And Travis got to speak to his doctor who believes last night was a side effect of the chemotherapy. A side effect that doesn’t usually come until you are on chemo for several months or even years. But Travis is a freak. He’s back to being non-human. He doesn’t get those pesky side effects like fatigue or nausea or hair loss. He get’s lightening bolts through his brain. Tonight we have part two of the six part interview series. If you did not get a chance to see Part One, or would like a refresher, I encourage you to watch it first. In tonight’s short, four minute clip Steve gets Travis to open out about first finding out that “something” is going on and what that was like. In a way, perhaps, this was the first time that Travis realized he was human after all…. Legal Disclaimer…All blog posts and videos are Travis’ experiences and opinions. Travis is not a medical expert or even in the medical field. Cancer is different for each person and so nothing on this blog should be taken as fact or used for determining diagnosis’s or treatments. Travis Roberts. Not your typical cancer patient. That’s my friend. Funny, witty, brilliant, sarcastic, annoying at times Travis. He’s not your typical cancer patient. Travis’ third treatment of chemotherapy was this past Thursday, June 13. And, since he meets with Dr. Hamrick every other week, he also got to see him. His rockstar doctor. What I wouldn’t have given to see the face of this man. This brilliant medical doctor who, at the age of 42, has already worked his way up to the head of oncology at Kaiser Permanente. A man who has seen a lot. A man who has basically seen…it all. But he’s never seen Travis. Nor anyone like Travis. I would have LOVED to see the look on this man’s face as he sat across the desk from Carrie and Travis…in awe. Travis…I…uhhhh…I got your CA19-9 results back. Ummmm…yeah. There down to 57,000. Yeah. Uhhhhh…I don’t know. You went from 161,000 to 57,000 in two treatments. I can’t explain it. Ummm. Yeah. Wow. Ok. So that’s not how the conversation went. But I bet it is close to what he was thinking. An “anomaly”. An “outlier”. Man’s words to describe the unexplainable. Man’s words to describe God’s miracles. So Travis took his amazing news. His incredible news. His miraculous news. And went to his third, five hour session of chemotherapy. And from there…he went to his friend’s rehearsal dinner. And then Friday he went to a golf outing honoring his friend. And Friday night he went to a BBQ for the soon to be newlyweds. And Saturday he went to the wedding…and the reception…and the after party. I am exhausted just typing this…and I didn’t have chemo! Well. Come Sunday. He crashed. Hard. He spent the day in bed. Exhausted. He has some pain in his scalp and a little swelling in the arm he got his chemo in this week. But it took all that to bring out the symptoms. Why? Because he’s just not your typical cancer patient. Over the next week or so we will be releasing an interview that Travis’ friend Steve Barnes did last week. It is a six part series and each video is between 4 and 8 minutes. This will give out of town friends a chance to see Travis and how well he is doing. It gave Travis a chance to tell his story…in his own words. To tell…how he is not your typical cancer patient. Disclaimer…as you can imagine, being interviewed on the spot (without rehearsal) can be nerve racking. Travis did a great job but, under the pressure, mixed up a few facts. In this clip, he states that anything beyond Stage 2 Cholangiocarcinoma is considered incurable. It’s not quite that “clear cut” since it depends on if it is intrahepatic or extrahepatic. To read more about the survival rates by staging, visit The American Cancer Society. Check back in the next day or two for part two…. We are so excited right now!!! Remember that CA19-9 number??? It’s the tumor marker that tells us if the cancer is responding to the chemo. We just met with Dr Hamrick! He gave us great news! ARE YOU KIDDING?? It’s dropped 78,000. Travis asked if that means the tumors are shrinking and he said ABSOLUTELY!!! We don’t know how much BUT they ARE shrinking:). I have to admit that I think I have been in denial this week…I guess that is what you would call it. For the first time I have gone a few hours multiple times and have not thought about the fact that Trav has cancer. Sort of a weird feeling…My sister came to visit Thursday and we took our boys to Monkey Joes. On the way home she asked how Trav was doing. It took me a second to remember why she was asking. In fact I did not think about the cancer while we were at Monkey Joes at all. Isn’t that nice? Just fun times with my sister, my sweet nephew, and my two boys! It is interesting how each week, each day, is so different. In order to share what I want to today, I have to go back a little. Travis was a Risk Management Insurance major at UGA. Thank goodness for that because he has always known the importance of insurance. Life has smacked us in the face lately. It has been really hard, but I am so happy about a few things that we have done to prepare for the worst. I can’t imagine the stress that we would be feeling if we had not planned ahead. So, there is a man that we know named Matt Goodwin. We met him about 8 years ago when we bought Northwestern Mutual Insurance through him. We have grown to be friends over the years. He has no clue that I am sharing this (until he reads the blog ☺). About 5 years ago, after Trey was born Matt told us that we should buy a life insurance policy on Trey. I was honestly horrified. Why would I put a life insurance policy on my baby??? I couldn’t think of anything more horrible. The last thing that a new mom wants to think about is something bad happening to her new baby. I would not want to benefit if something bad happened to my child!!! He explained that it would be a policy that accrued money and would be a savings plan for Trey at the same time as being a life insurance policy. At that time, THAT was what sold me. A savings plan?? ?… SURE! BUT…today I am so grateful that we did this for our kids and NOT because it is a savings plan. With these policies, if GOD FORBID one of my kids gets sick at any point in their life, and I mean sick enough that they are no longer eligible for life insurance, they will have these policies. Not only will they have the policies that we purchased for them, but they will also have the opportunity to increase the policies without additional medical questioning later in life. We can pass these on to them when they are responsible adults. They can leave them as is or add to them. Of course we all hope that our children will always be healthy enough to get life insurance. We all pray for the health of our children constantly, but as I am learning, you just never know. I think that it is a really great gift to give your children if you can. It is a guarantee to protect their families in the future. That is just food for thought, but it sets up the story that comes next. So, anyone who has a 3rd child probably knows that you start slacking when it comes to that 3rd baby. Fewer pictures, fewer new clothes, fewer rules. I mean, sometimes you completely forget about them. Haha! Our 3rd baby, Jake, looks just like Trav. That’s what everyone says anyway. He is our only dark-eyed baby. He is laid back and so adorable. Just a total chilled out little guy!!! Poor Jakey just turned two, and guess what I had NOT set up for him yet. His life insurance policy! Of course I thought about it 100 times. I intended to do it from the time he was born, but it was not at the forefront of my mind, like, EVER! Recently, we have had some meetings with Matt Goodwin, and I mentioned to him that we better get Jake’s policy set up. Matt came over one day. We sat at my dining room table as we have many times. We went over the same form that he and I had gone over for Trey and then for Piper. Everything, the same! We went over the many medical questions that Northwestern Mutual requires for underwriting. Does he have any heart problems? Has he had any surgeries? Mental issues? Learning issues? Permanent prescription drugs? With each child I remember thinking how thankful I am that my babies are healthy as Matt reads the LONG list of possible medical issues. To each question, I answer “NO” he does not have that. All of my babies have been healthy. Know this, I am so grateful for that, and my heart just breaks for our friends who have children who are not healthy. I have so much love, respect, and sympathy for those parents. With Trey, Piper and Jake, EACH ONE HAS BEEN THE SAME!!! HEALTHY! HEALTHY! HEALTHY! We get to the end of the form!!! Something is different???!!! My heart sinks. Matt looks at me with a sad face because Travis is his friend. This news about Trav’s cancer was a big blow for Matt. They have a special relationship filled with respect. We both know that Trey was underwritten with a healthy daddy. Piper was underwritten with a healthy daddy. If I would have applied for Jake’s policy 1 year ago, he would have been underwritten with a healthy daddy. Does it really matter for Jake’s policy? Not really. Does it matter for my heart? Yep, Big Time! In that moment, I realized that from now on when I am sitting in the doctor’s office, and I am filling out those forms for my kids, I will have to put Dad has Cancer under the Family Medical History section! Trey, Piper, and Jake’s Dad at 38 years old has cancer. Cholangiocarcinoma. Incurable Cancer. Even if Travis is 100% healed by the grace and mercy of Jesus Christ, I will still need to write cancer on my kids’ medical charts. This one stings! I don’t want my babies to grow up with this on their medical charts. I don’t want to write it on their forms. I don’t want to explain what kind of cancer Travis has to every new doctor that we see in the years to come. Seriously, you DO NOT want to see the faces of the doctors when we say Cholangiocarcinoma. I don’t want to hear my kids say, “My dad has cancer.” I don’t want them to feel this pain. But, it is here! Their Dad Has Cancer! YUCK!!! That sounds dumb to just say “yuck,” as if that touches on the horribleness. I don’t really know how to express the feelings though. It is just hard sometimes. Writing it was an unsettling experience. A sad moment. As I said earlier, every day is different. Actually, every hour or minute can be different. I will end by sharing that we were on the boat a bunch this weekend. Trey and Pippi both went out on this inflatable ski trainer that goes behind the boat. It was a beautiful weekend at the lake. The kids were as proud as they could be about the ski trainer. ☺ Trav and I were as proud as we could be watching them stand on this little inflatable raft. We were laughing and smiling and loving our family time and our time with friends. This is what we love to do more than anything. We are so grateful for the good days. We spend very little time focusing on the scary stuff. The scary thoughts come! We cry and then we thank God for the good and we move on. Thank you God that Trav feels as good as he does. Thank you God that it looks like his cancer is responding to the chemo. Thank you God that we are such a strong family. Thank you God for putting Trav and I together long ago so we had time to grow into this team. Thank you God for our friends and support group. That’s what he is. I am not just saying that because he is one of my closest friends. Because I want to believe it. Because I want it to be true. I say it because that is what it is. First…let’s talk lymph nodes. Those pesky little things that swell up in your neck when you get sick. Those things the doctor pushes around on, in your neck, when you go in for a check up. But your lymph nodes are not just in your neck. They run through your body as a part of the lymph system. Check out this figure. 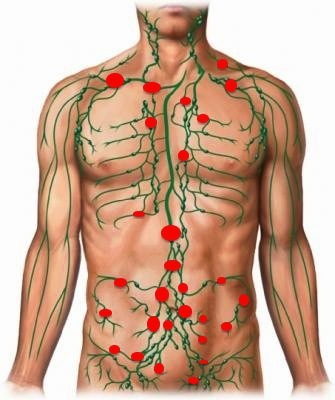 The green is your lymph system and the “bubbles” are the lymph nodes. What do you notice? They are all connected. Remember that. It will come in handy later. Now let’s take a look at where the cancer has hit in Travis’ lymph nodes. Everywhere you see red…Travis has cancer in his lymph nodes. More or less. So where is the miracle in that? It is simply unheard of. It is a miracle that the cancer, as it has moved through his body through those connected lymph nodes, has not “jump shipped” onto another organ. The diaphragm basically divides the chest cavity from the abdomen. The cancer has passed by the large intestine, small intestine, gallbladder, pancreas, stomach, through the diaphragm, past the lungs…and has not touched a single one of them. 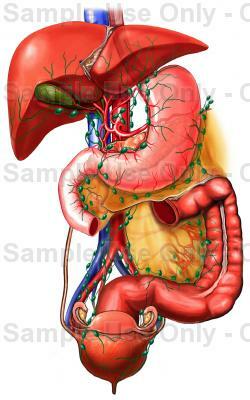 And that is just the abdominal cavity. The cancer moved through the lymph nodes. These lymph nodes that encircle and intertwine with the organs, and never touched them. But. It’s still hard to hear the doctor say “yep. you light up like a Christmas tree.” When those words come out of the doc’s mouth… When you see how they look at you… Your mind plays tricks on you. The enemy plays tricks on you. And despite the miracle…you get worried. Travis got a second opinion on Wednesday. Well. I guess technically it is a fourth opinion. Or is it fifth? Who knows…always good to cover your bases. A friend got him the appointment and just wanted him to meet with this doctor who has saved other’s lives. And so he did. And the doctor looked at his images and looked at Travis. He looked at him like he was a walking miracle. How can this guy have it from his groin to his clavicle and it not be in his organs? Wow…how are you standing before me seemingly healthy when you have this much cancer? And so the look can be discouraging despite the encouraging words. Despite knowing you are a walking miracle. CA19-9. It’s the cancer marker that tells the doctor how Travis is responding to the chemotherapy. 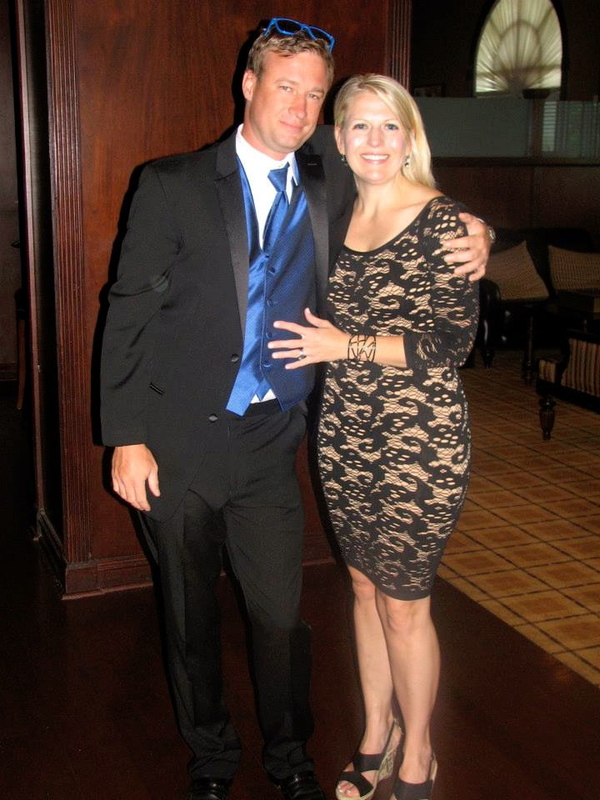 The first time Travis had this test done was on the day of his liver biopsy – April 16. Normal is below 35. Travis’ was 91,000. Travis and Carrie thought it was a typo. But it was not a typo. 91,000. That was his starting point. Yesterday, Travis had his second treatment of chemotherapy and, prior to starting, he and Carrie met with Dr. Hamrick. They asked for the results of the CA19-9 test taken on May 15, the day before his first treatment of chemotherapy. The test taken just four weeks and two days after the initial test. Just 30 days later. Just one month. Yes. We did. We heard. We were told. But 161,000???? In a month? If you go to the message boards on cholangiocarcinoma.com you will find people worried about 300. 400. Even 1000. But 161,000??? But again. You can tell yourself you are a walking miracle. You can convince yourself you are the “outlier”. The “exception”. The “miracle”. But your mind plays tricks on you. Your mind says otherwise. And so. As Travis sat through his treatment yesterday. His five hour treatment. With poison running into his veins to kill this thing that seems…invincible. One thing kept running through his mind. Over. And over. And over. This morning Travis awoke. And thanked God for another day. Another day of being symptom free. Another day of life. Another day of being a miracle. But he had something more to say. Something more to ask. Speak to me God. Let me know You are hearing our prayers. Let me know You are there. And he opened his Bible. As I have mentioned before, Travis is new to Bible study. He is still figuring out if Galatians is in the Old Testament or New. If there is a difference between Corinthians and Chronicles (uhhh. big difference. huge). Suffice it to say…he doesn’t yet know his Bible. But he is trying and following the advice of his father…sticking to Matthew, Mark, Luke and John. God spoke to Travis. He met him where he was and gave him a gentle reminder. But He wasn’t done. Shortly after this Travis was talking to Carrie. Explaining to her that he was “all for the miracle”. He was hanging in there and trying his best to simply have faith. But just once. Just one time. He would like something tangible. He would like some good medical news. Just once. Something encouraging. After what seemed like punch after punch after punch to the gut. Just good news for once. An hour later the email came. Great news. Got your CA19-9 back from Wednesday’s test. Down to 135,000. In just two weeks. After a single treatment. A 16% decrease. THIS MEANS THE CANCER IS RESPONDING TO THE CHEMOTHERAPY! Something they weren’t sure would happen. Something that doesn’t happen for a lot of people. Something that could have been another punch in the gut. But God spoke again. He spoke to Travis. This time the reminder wasn’t so gentle. It was tangible. God spoke to His walking miracle.